Factual error: The Russians stopped using steam locomotives in the 1970's. So bringing one out of retirement in 1997 to haul nuclear warheads would mean that your highly secret nuclear train would be well known among rail enthusiasts for weeks before. Continuity mistake: As Nicole walks across a plaza with Clooney to meet the Russian spy, she is wearing sheer stockings and low pumps. As she walks off the plaza she is wearing knee high boots with fur tops. Factual error: When they download the requested file from the computer you can read ie. "600 Dantensatze in Databank." Correct is: "600 Datensätze in der Datenbank." At the same time when the bad guys try to identify Clooney you can read on the screen the German "Gerwicht" for weight. Correct is: Gewicht. Continuity mistake: In the first scene that introduces us to George Clooney's character, we see him in front of some sort of Judicial committee. The first scene he wearing gold leaves which indicate the rank of Major, although in the movie he is a Lt. Colonel. Then very next scene when we see Clooney he is wearing the correct rank. Plot hole: Where are the police? The chase takes about 8 minutes in the centre of the biggest city and capital of Austria, not to forget the using of the guns. 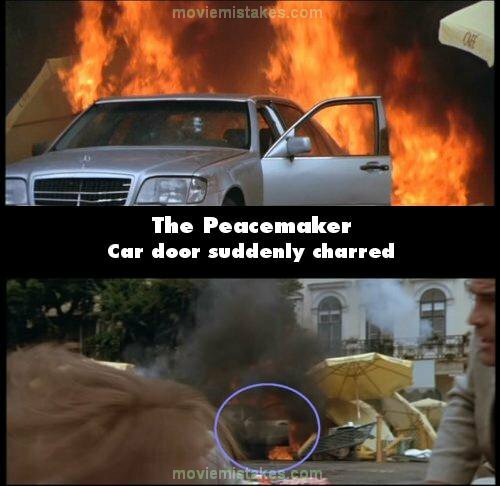 Other mistake: In the subtitles, when the Russians are locking onto the US Army helicopters, "Attack" is incorrectly spelt "Atack". 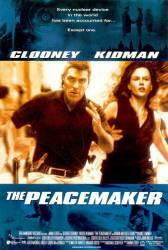 Other mistake: When they have recovered the nukes, after the nukes are set on the bridge George Clooney is rolling on the ground. His gun holster is unfastened and the gun is missing. A few moments later when he is talking to Dr. Kelly on the phone, the gun has reappeared. Continuity mistake: When Clooney is fighting in the truck on the bridge, he is pulled up by the helicopter. As the camera follows him, you can see him pulled up at least 10 meters. When cutting himself from the cable he falls back into the car. but only about 3 meters. Factual error: When LtCol Devoe enlists the help of the US Air Force in Turkey to intercept the truck carrying the nuclear warheads, the squadron is operating Eurocopter AS 565 Panther multirole helicopters. The USAF does not and has never had AS 565's in their inventory. Plot hole: When the diesel train stops in the tunnel, one of the soldiers tells another one how far they are from the spot where the nuclear detonation will take place. Do the math: the distances don't work out. At least one of the trains would have to do over 100mph AVERAGE to put enough distance between them. Military precision, indeed. Continuity mistake: When the helicopters return to base after capturing the warheads, it does a shot showing both of the helicopters coming from either side of the shot and landing. The next shot from the hangar however, shows one of the helicopters landing again.